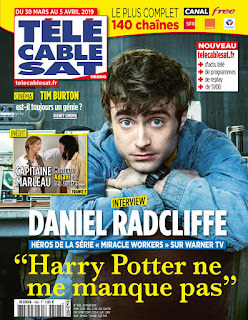 French TV magazine Télécâble Sat Hebdo's interview with Daniel in promotion of Miracle Workers. Miracle Workers premieres tomorrow on Warner TV in France. Miracle Workers is your first hero experience in a TV series. Did you expect that? Not at all. It is odd to participate in the long run by simply reading the story of a pilot, which is just the beginning of a story. Not knowing what's happening scares me. So I refused many projects. Why did make you change your mind? Simon Rich! He was so specific about the subject and his story that he reassured me. How did you discover the world of Miracle Workers? It was my girlfriend who gave me the book to read years ago, the book that inspired the series, What in God's Name. I thought it was great and I made an appointment with Simon Rich. I told him I was interested in the subject and told him that one day, when he would have plans to adapt the novel, I would want to be involved. How long have you been without news? A whole year Then he contacted me at a time when I did not expect it. He told me he was going to do a TV show and that the ball was in my camp. I immediately took my phone to call my agent and his team. I told them, "I know you hate to go in that direction, guys, I know it leaves little room for negotiation, but What in God's Name is going to be a series." Get as much as you want, but I want to be a part of it. " What made you so excited about this project? The whole story, the way it was written and most importantly, I thought it was the right time to do a comedy. It's a story of incredible darkness and at the same time incredibly sweet and reassuring. Simon masters this mixture of darkness and light perfectly. It's crazy! It is an underpaid angel who is in charge of answering the prayers of the people. Soon, he will be angry with God (Steve Buscemi), who manages heaven as a real business. I really like to play him, especially since he evolves a lot during the season. Yes, we shot in an abandoned factory. We were all stunned during a walk around. Every machine, every tool, every element of the original factory had been redesigned to make sense of the story. For the most part, these items only appear on the screen. But it is this requirement that gives credibility to the whole. Do you think that the world of Harry Potter and the world of Miracle Workers have something in common? Do you miss Harry Potter? Sincerely no! Some people I've worked with miss me of course. I have good memories at the movies and I know what Harry Potter means to me, but I do not miss Harry.